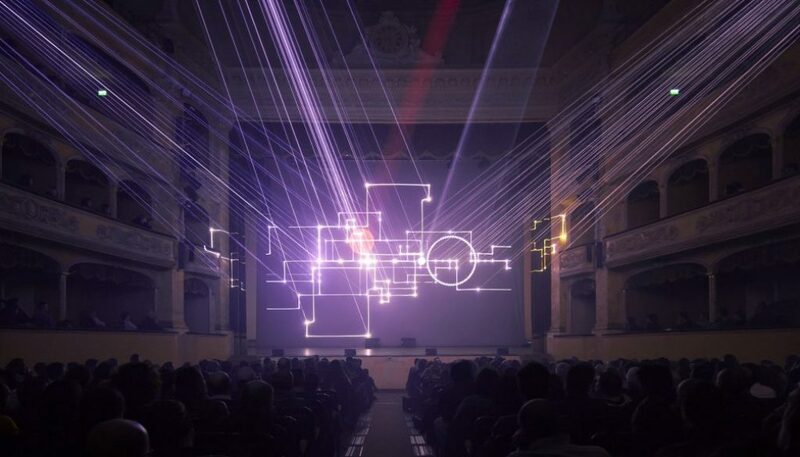 Lumière is a concert series by Robert Henke exploring the artistic dialogue between high precision lasers and percussive sounds. It is based on a unique vector graphics software, which the artist is developing since 2010. Drawing with lasers requires the precise and fast movement of small mirrors. This imposes severe limits on the achievable complexity. Lumière embraces these properties with its minimalist approach. The software allows the generation of rapid successions of visual shapes and associated sonic events, and the manipulation of them in real time. During this presentation, Henke will explain the basic concepts of the Lumière software and demonstrate various parts of the work he has developed with it over the years. Robert Henke is a composer, installation artist and software developer, born 1969 in Munich, Germany. He is mainly known for his contributions to contemporary electronic music and for his laser works. Coming from a strong engineering background, Henke is fascinated by the beauty of technical objects. Developing his own instruments and algorithms is an integral part of his creative process. He utilises mathematical rules, controlled random operations and complex feedback loops to build the machines driving his art. Many of his installations change slowly and over long periods, and are specifically conceived or adapted for unique locations and their individual properties. Robert Henke’s musical work has a particular focus on rhythm, timbre and color, and he is recognised as a pioneering explorer of surround sound and wave field synthesis. His long term musical project Monolake, founded in 1995, became one of the key icons of a new electronic club music culture emerging in Berlin after the fall of the Wall. Robert Henke is also one of the main creators of the music software Ableton Live, which since its invention in 1999 became the standard tool for electronic music production and completely redefined the performance practice of electronic music. He writes and lectures about sound and the creative use of computers and held teaching positions at the Berlin University of the Arts, the Center for Computer Research in Music and Acoustics (CCRMA) at Stanford University, and the Studio National des Arts Contemporains – Le Fresnoy, in Lille, France. His installations, performances and concerts have been presented at Tate Modern London, the Centre Pompidou Paris, Palazzo delle Esposizioni in Rome, Le Lieu Unique in Nantes, PS-1 in New York, MUDAM in Luxembourg, MAK in Vienna, the Art Gallery of New South Wales in Australia, KW Institute for Contemporary Art in Berlin, STRP Biennale Eindhoven, and on countless festivals including Unsound, CTM, MUTEK, Sonar, New Forms Festival, and others.